Bedford Park Tree Trail at BedfordWalking RouteDiscover some of the more unusual trees (and Bedfordshire Champions!) in Bedford Park on this self-guided trail. 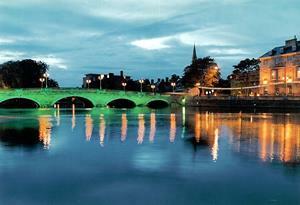 Bedford is easily accessible from the M1 via the A421 or from the A1 via the A603. Bedford Park is situated to the north of the town centre - take the B660 (Kimbolton Road) and turn left at Park Avenue. Bedford Park is situated along the right hand side. Parking is available along Park Avenue and there is a car park at Robinson Pool. Start description: This walk starts and finishes at the main gates to the Park, opposite De Parys' Avenue. Discover some of the more unusual trees (and Bedfordshire Champions!) in Bedford Park on this self-guided trail.